Muhammad Ali (1942-), American boxer and three time World Heavyweight Champion. Also called ‘The Greatest,’ Ali has had one of the most successful and noteworthy careers in boxing. 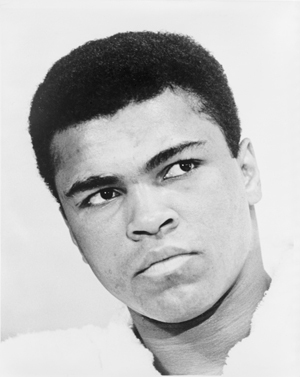 A devout Muslim, Ali was given the title of Ring Magazine’s “Fighter of the Year” more times than any other boxer. Ali was also named “Sportsman of the Century” by Sports Illustrated in 1999. In 1984 Ali was diagnosed at the age of 42 with Parkinson’s disease, a chronic neurological disorder that affects a person’s movement and coordination. The first signs of the disease usually include a tremor in one hand, then progressive difficulty making normal movements. Ali was demonstrating a tremors, stiffness, and slow motion when he was diagnosed with the disease, only three years after his retirement from boxing. It is speculated that his disease was contracted from repetitive head trauma as a result of his boxing career, although in recent years Ali has said that he has no regrets. Ali is prescribed medication to deal with the severe symptoms of his condition. One of the most common Parkinson’s disease treatments is levodopa, which supplements the body’s decreasing levels of dopamine. However, after about 5 years on the treatment, patients experience what is called a ‘wearing off’ effect, in which it takes more treatment to have the same effect. This makes it difficult for patients not to develop a dependency on levodopa, which also has additional side effects like loss of muscle control, nausea, and vertigo.